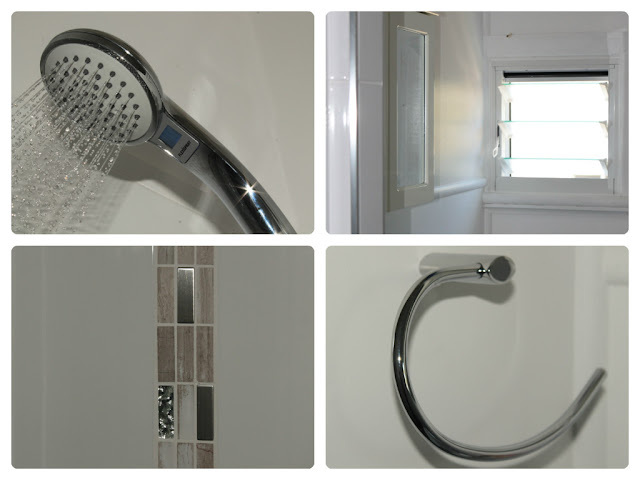 ...the re-sheet, re-tile, re-fit and reveal!! As for the toilet, well I am just glad (for your sakes) that I didn't get a picture of the actual bowl itself. It was so disgusting that I was genuinely worried the girls would refuse to use it...it was feral! But to my great surprise they didn't moan about it once! 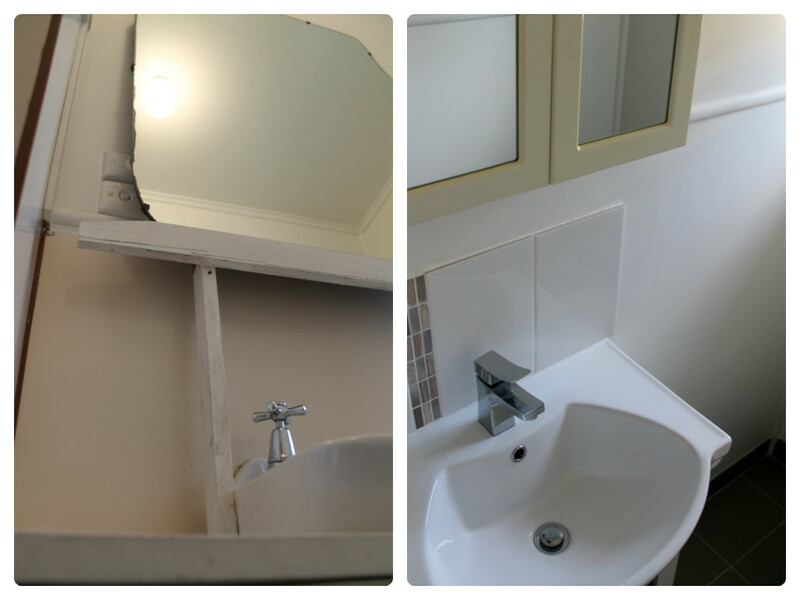 So when we could see the bathroom taking shape and slowly but surely morphing into a usable room, from the frame of gorgeous silky oak that we took it back to, it was awesome! 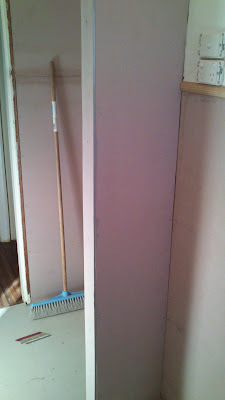 An end was in sight to the use of our 'pink princess' bathroom suite next door. However all moaning aside we are actually very lucky that we had a second bathroom to use while we were doing up the other one, it has obviously made it far easier to manage, especially with the two girls. Anyhow back to the issue at hand of finishing the small bathroom; the first job was to get the walls re-sheeted. Our chippie Nick-Nack took care of this for us and did an awesome job - as always. The taps were fixed by our plumber (the hot and cold pipes were back to front) and as it wasn't to code it had to be rectified. The beauty of taking off the damaged and uneven panels (apart from the obvious of seeing what the bones of the building are like underneath all the panelling) is that before you re-sheet, you can add noggins in areas that need support for things like shower rails and towel rails. (I say this in hindsight because with this bathroom we forgot to add a noggin for our towel rail to be attached to. It doesn't particularly matter on this occasion as we can attach the one we want to a stud, but if we had have thought about it at the start we could have added a few options across the walls and not had to stick to one wall and one stud. As we keep saying...this is the learning house). Nick-Nack's work is so neat and totally flawless, he gets picked on by the other tradies for taking his time, but by golly his work is top notch. The new shower cavity re-built...even though this is just the base sheeting it already looks amazing, like a totally new room. Once the sheeting had gone up and was finished, the next guy to come in was our wet sealer. Again this was a job that we could have done ourselves but if you get it wrong you are stuffed. Once that room is sealed and the floor and wall tiles go in that's it. A leak in the wet sealing would be a disaster in terms of finding the leak, pulling up the tiles, correcting the leak, correcting the damage and re-tiling. So we thought we'd leave this to the pro's. 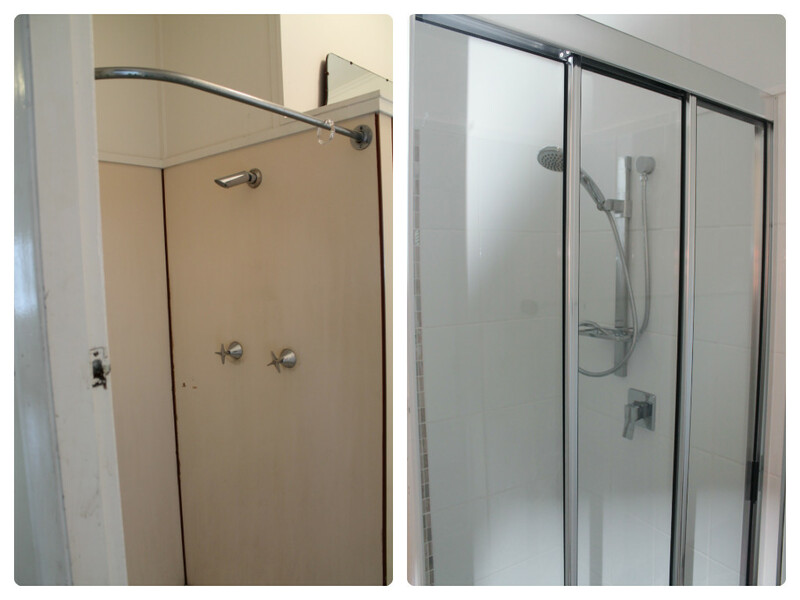 Wet seal and shower hebel block down, looking like a real shower already...next job - tiling! I could write a whole blog post on our tiler..maybe another time. But suffice to say with him and our chippie we have friends for life. Our tiler is called Bin (he has a long, grey, bushy beard..say no more) and his work is super fast but awesome at the same time. He is the kindest, funniest man who goes out of his way to help us. I loved watching the tiles go down, Bin would often turn around to find me staring at him work, he would just roll his eyes at me, laugh and carry on. The screed going down for the floor of the new shower base, Bin rang me the day after the room was finished and said 'please tell me it drains well'...it does! I couldn't help but photograph this trim, I just wish the koalas and kangaroos were visible when it was put in..Col, funnily enough, is glad that they aren't. Our feature tile going up, I could seriously watch tiling going up all day..sad but true. 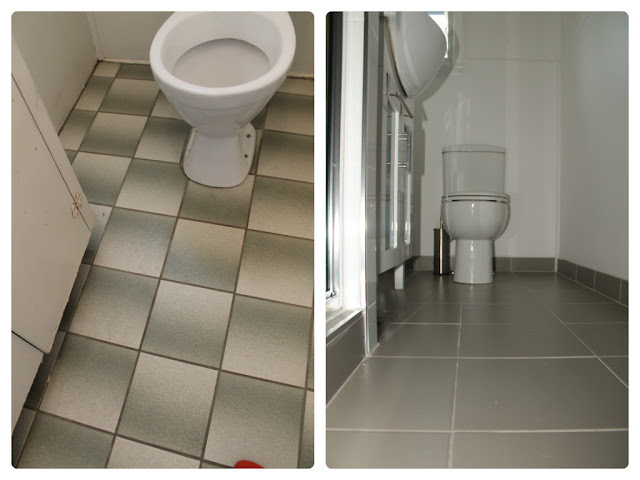 Everything finished and grouted...before the cleaning off obviously! Once this was all done, we were on the home stretch, all that was left to do was for Greggy our plumber to come in and fit all the new 'stuff'. We purchase all our products ourselves to keep costs down, just because the tradies have trade accounts doesn't mean they will be getting cheap trade prices. Often their suppliers don't get the huge discounts bigger stores give so this way we can keep control over what products we want and often keep the cost a bit lower too. However, everything we buy for our fit outs are always checked first with our tradies. When we first started this project we had our sparkie tell us which fans and lights we should and shouldn't buy and why. They are the experts, the ones who have constant call outs to fix dodgy products that the shop said were great etc. There is nothing worse than going for a bargain, or product you love design wise only to find out it is rubbish. So although we source it all ourselves, we check first and buy later to make sure we are getting a quality product that isn't going to need replacing in 6 months. So far we have picked ok! Occasionally we will go through one of our tradies to get a particular product that we can't source ourselves but there will be more on that when we do our kitchen re-fit post. The last thing I just HAD to add to this page is a little note about the shower. 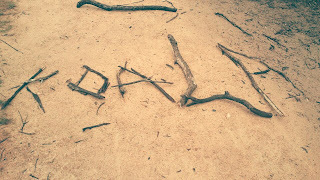 It is soooo darn cool. The little LCD screen you can see (last picture below) is powered by a mini hydro electrical component inside. It tells you what temperature the water is at and how many litres you are using. In addition to that the screen itself glows a deep blue if it's cold, a vivid lilac for the 'just right' temperature and bright red if the water is too hot. So the kids can tell instantly whether the temperature is OK for them to step under....fantastic! So here we have it...all finished and we love it! You can find the specs to all our products on the Design Book page. Hope you like it as much as we do! The 25th of April, ANZAC Day, is an important day for Australian's and New Zealander's. It is a day when we remember those young soldiers who landed on the shores at Gallipoli on the Turkish peninsula, our first military action since federation. In addition to remembering those killed and wounded in the great war, it has also become a day to remember those killed and wounded in all wars and conflicts. And we pause to thank those who continue to serve and who maintain the ANZAC spirit. ANZAC stands for Australian and New Zealand Army Corps, the soldiers in those forces quickly became known as ANZACs. The qualities shown by the ANZACs of courage, mateship and sacrifice have been upheld by both countries soldiers since the end of World War I. For Australian's, it is a day of national remembrance, and many people choose to attend commemorative services around the country, usually a dawn service followed by a 'gunfire breakfast', continued mid morning by a march through the streets to a cenotaph or memorial for another remembrance service. 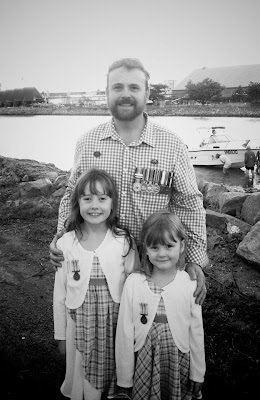 For our little family unit, and being a military family, ANZAC day has been one of our most important days of the year. I have always found ANZAC Day to be important, as it reminds us of the sacrifices that were made by many, so that we could enjoy the freedom and opportunities in life we have today. This one was extra special as it was Poppy's first time marching with her school. We have taken the girls along with us every year, bar one in America, getting up at 4.30am to be in place by the time the ceremony commences. When I have been deployed overseas, Kate has remained steadfast, gotten the children up, and taken them to the dawn service on her own, while I obviously have attended the dawn service overseas. Below is a photo taken just after this morning's dawn service which was at ANZAC Park on The Strand in Townsville. As a serving member of the Army, it took on new significance after my first deployment in 2001 to East Timor, and even more so since being married and starting a family and having to endure the separations imposed by future deployments. Besides East Timor (now Timor Leste), I have deployed twice to Afghanistan, 2008 and 2010 and also had two shorter trips to Iraq in 2008, and Afghanistan in 2009. As a family that has meant many months apart, birthdays and special occasions missed, but that is unfortunately a necessary inconvenience for those who serve. In attending the ANZAC Day services every year, it is my hope that our two girls will grow up knowing the price of freedom. That they will hear, every year, the sacrifices made by those who have served, past and present. They will hear the stories of great achievements by ordinary people in extremely adverse circumstances from old veterans of the great wars. They will understand why we have people deployed overseas today defending those freedoms. And from all of this they will understand why their Dad (and many of their adopted Army uncles) were always away, and why we missed all those special family events. Later in the day we went to one of the two big marches in Townsville, I marched with the two girls in Poppy's school group, while Kate took photos and provided a mobile cheer squad for the girls. It is always very humbling to march in an ANZAC parade and receive the thanks from well wishers who line the streets. When finished we departed for home with two very tired girls in tow, but both very happy and proud to have made the effort to remember those who serve and have served. For me the solemn tone to ANZAC Day is best summed up in the poem 'Flanders Fields'. Whenever I read it, or hear it, I think of all those who made the ultimate sacrifice in the name of freedom, and I think of comrades and friends from recent times who served and are no longer with us. The week before last we were lucky enough to have some great Texan friends come to visit us from Guam. It proved to be the perfect excuse to have a couple of days off and fit in a sneaky visit over to the Island to really get away from the house for a bit. It was going to be our 'little bit of calm' before the mayhem that would follow (the day after they left we were beginning the master bathroom and kitchen refit all in the same week). However the weather decided to put a mini dampener on our plans as the Ville experienced its first 'wintry' weather in a loooong time. So our week was actually dubbed the 'storm before the storm'. Despite the gloominess we left our house, with our darling friend Natalya to look after (thank you), and headed over to Maggie on the ferry to show our guests around, with the promise of seeing some Koalas in the wild. The sky was grey, the sea was a little choppy and murky..not a pretty sight, and it rained almost non stop for 3 days! But even though the Island didn't look as beautiful as it does the other 95% of the year, it was still lovely being back there. We love Magnetic Island, it was where we got married 10 years ago, we fell in love with the place then and still love it just as much now. On our first night the weather turned sooooo cold that we had to pull out our jeans and heavy tees or long sleeved tops, (apart from our guests, they found the break from Guam's year-round hot and steamy weather a rather welcome change). Overlooking the 'usually bright blue' water in Florence Bay from the Forts Walk. Of course we couldn't leave without doing the afternoon Rainbow Lorikeet feeding, our American friends could not believe the sheer number of them who flew in for their arvo snack, never mind the noise and colours! I have to put in a shameless plug for the resort we stayed at (Island Leisure Resort) We couldn't fault it at all, it's well situated, wonderfully quiet, reasonably priced, the staff are superb, and even has lots of indoor activities to keep children happy too, including a dedicated art and craft room for the younger ones. 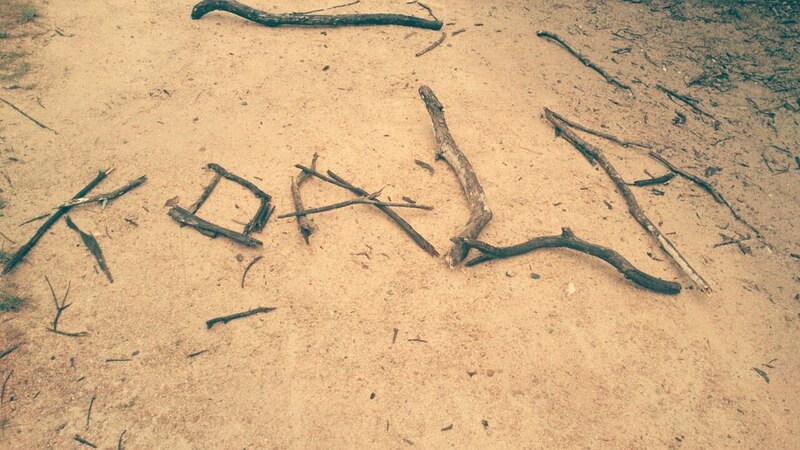 If you are heading over to Magnetic Island you should really check it out, we will definitely be staying there again. Thankfully Mother Nature did turn on the blue skies and warm sunshine for their last few days here, so our visitors got to see the Ville at its finest. They hiked Castle Hill's Goat Track, visited many gardens and experienced our awesome Reef HQ and the water park on The Strand. 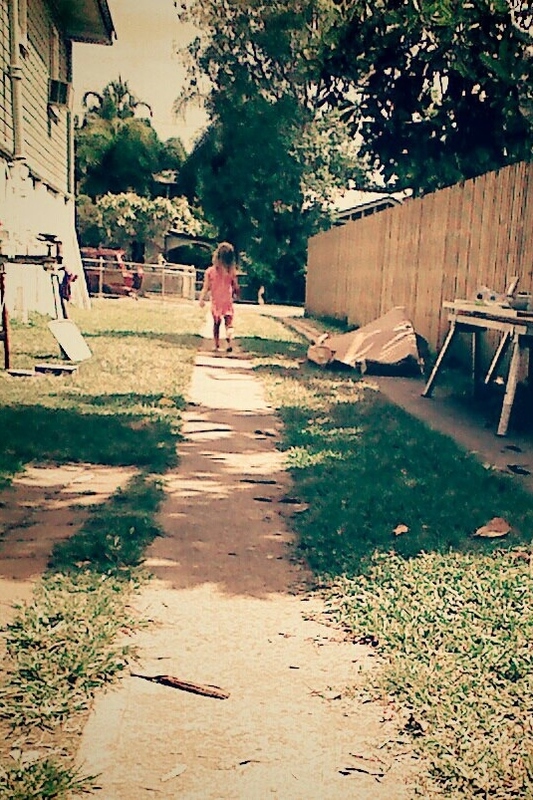 No sooner had we welcomed them, and we were already saying goodbye. We are so grateful for them coming to visit us and we're all looking forward to doing it again, next time it will be us going to see them in their hometown in Texas...we'd better start saving! PS - Our Small Bathroom is now complete!! So I will aim to update the blog by the end of the week. ... its downfall, demolition and deserving refurbishment! Considering this is a little 1950's Queenslander we are very lucky to have two bathrooms. They may be a tad odd in their positioning (I was very un-convinced in the beginning with the whole set up) but, none the less having two separate toilets is a huge bonus for this style and age of house. One 'could' be classed as an ensuite as it is just off the main bedroom, but it isn't really an ensuite in the true sense I guess, as it is the larger of the two bathrooms. 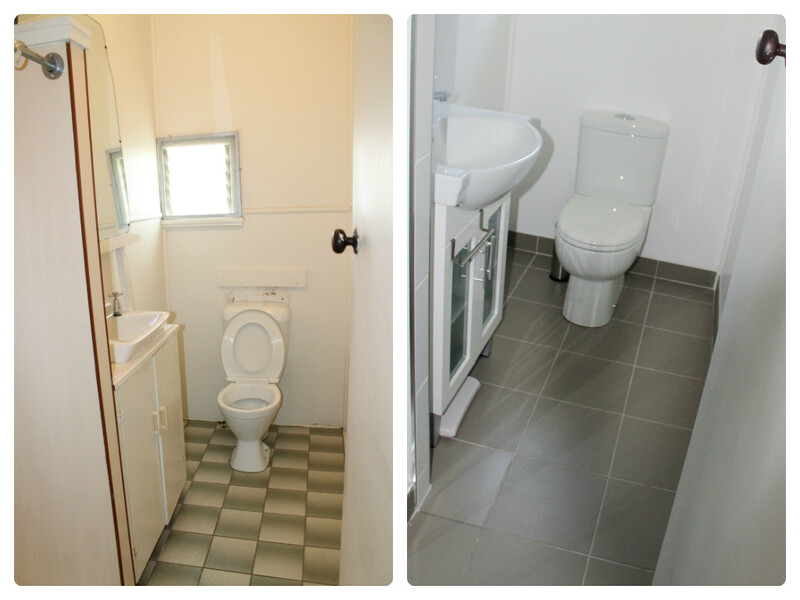 The second bathroom is the smaller kids/guest bathroom, it has a toilet, vanity and shower. Originally the house had one main bathroom which was a large, square room with a bathtub, vanity and shower. Then next to that room, through a separate door, was the toilet. Sometime in the last 10-15 years or so the bathrooms were slightly updated and changed around so the main kept it's original bath and vanity, but a toilet was added. Then a section was cut out to be added to the toilet room creating a shower space and making the second room a functioning bathroom instead of just a long narrow room with a loo at the far end. This is what The Small Bathroom looked like the day we arrived. .
Again, I cannot stress enough that this particular picture actually makes it look far nicer than it really was, the floor tiles were a dirty two-tone green. The vanity was a mish-mash of different timber off cuts, none of them appropriate for wet use. 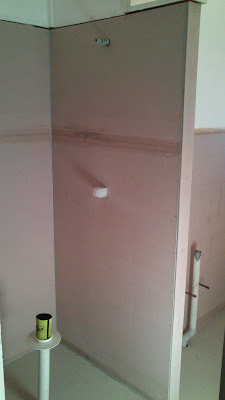 The mirror was an old dressing table mirror precariously leaning above the sink, not safe and far too big for the space. The shower had a cast iron shower tray and then these horrendous 'lami-panel' walls. The panel walls were all stained and had begun to absorb water, and it was totally useless with the shower curtain billowing back and forth in the breeze created by the water pressure from the shower head, allowing lots of water to spray out and create a nice big puddle of water over those fabulous dirty green tiles. We had a company come over to quote for some other cabinetry work, so whilst here we asked them if they could give us a cost to re-do the shower unit. When the quote came back at about *$5700 just for the shower!! We thought, whoa! We may have to just sugar-coat the bathroom for now, so that it looks better and think about the full reno of it later on. 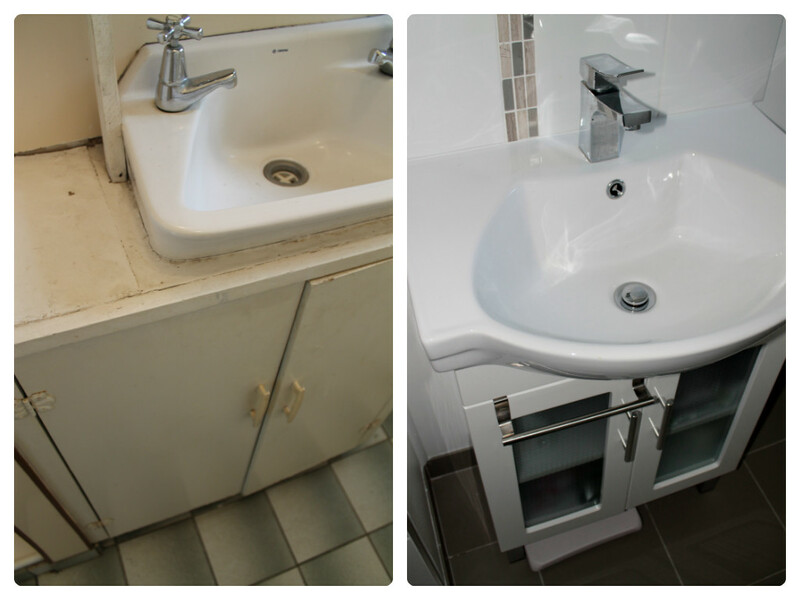 However, after a couple of weeks of living full time in the house we realised that a simple, temporary, surface re-do was never going to be an option, the bathroom needed refurbishment and it needed it NOW! 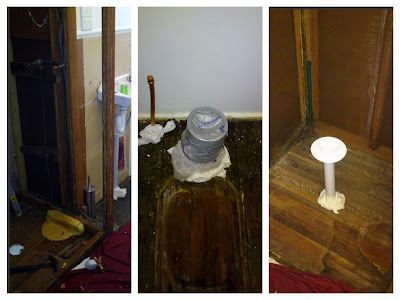 One morning we woke up to the most awful smell coming from the bathroom vanity unit. Over the course of the following days it got worse and worse. The whole unit had begun rotting. There must have been a slow leak for a very long time. It had probably never been an issue before as our tenant was a long distance lorry driver and so at a guess we think the unit would have lots of time to dry out between uses and never got very bad. 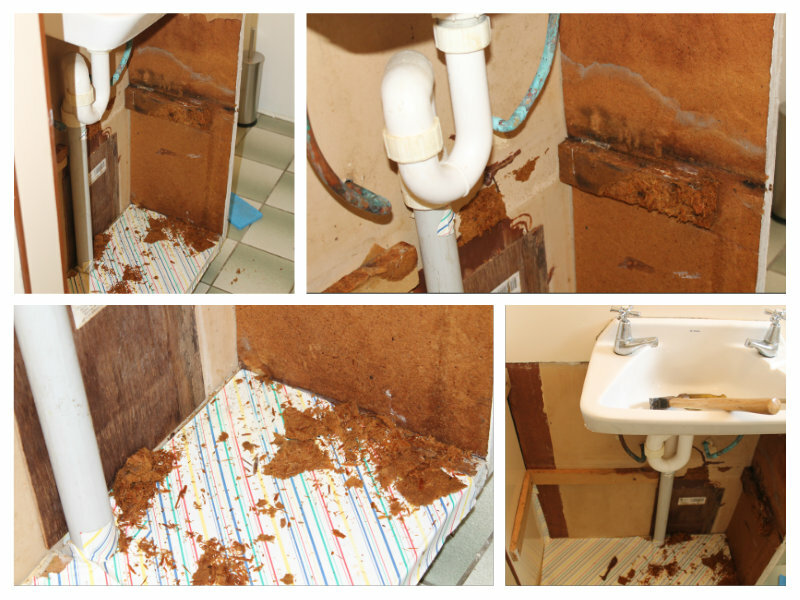 But suddenly four people were using the room daily and the wood soaked up every bit of leaked water. The wood had expanded 3 times its natural size and the smell was soooooo disgusting words cannot begin to explain, it was a mixture of sopping wet wood, thick mould and years of dirt...all enveloped in the heat and humidity of the tropics in February! Nice...getting the picture?! 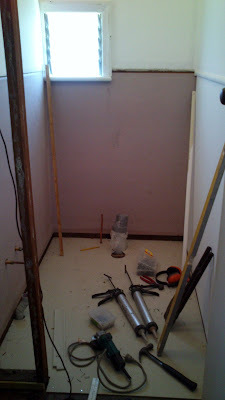 As soon as we had completed the Paris room we closed the bathroom down, and began the demo work; when I say 'we' I mean Col, he is our 'go to' demolition expert and is saving us heaps of money in labouring costs. Unfortunately we don't have a great picture showing the severity of the damage, because we started ripping it out and thought about photo's afterwards, but this gives you an idea. At this point he had taken the tops, doors and shelves out...oh my word... the smell!!!! 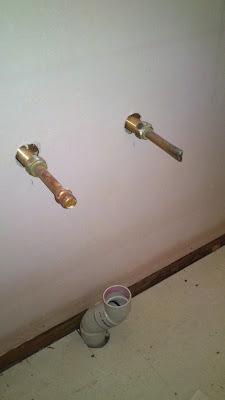 During this time we had luckily found the best plumbing company who in turn got us onto a whole heap of blokes who now make up our reno team when we need expert help. We have a chippie, wet sealer, tiler, glazier and cabinet maker...all on speed dial who help us out when the job is too specialised or we would need specialised tools to complete it with. Of course we also have a great electrician as well to do the jobs we absolutely cannot do ourselves (thanks goes to great friends here for putting us on to him). And not one of them charges the earth, they are all very reasonable and all very genuine guys. You can read more about our electrician experience here. 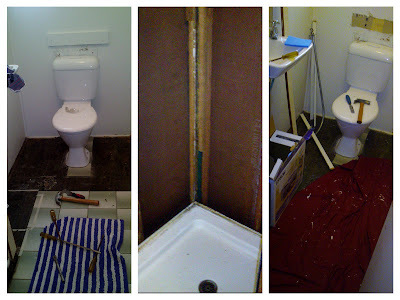 So we cracked on with the demo until the bathroom was well and truly gutted and ready for the next tradie to come and do his stuff. Followed by the toilet, shower base and sink (not shown), with the help of the plumbers of course! I have to say when it comes down to demo work like this, I sometimes feel like a bit of a fraud as often I can't help with much. For this one in particular there was only so much room in there to work, and often we only have one of certain tools etc. so there really wasn't much I could do. So, on this occasion while he was making lots of noise, and mess, I went off and started researching all the fit out gear, yeeehaaaa!! Spending money...I love it! More on that next time..
..stay tuned for Part II, the design, big jobs, small jobs, finishes and final reveal! *(Incidentally, we didn't end up using that overpriced mob on any of our jobs)! It's my faux time lapse of Col constructing the girls trampoline. I had only intended to take a couple of shots for our album, but I marked a spot on the floor and kept coming back every few minutes to take more pics. By the end we had over 100 photographs. I deleted about 30 or so and played around with them in movie maker for a few minutes and came up with this...enjoy! We have had a week of... jobs taking longer to complete, long days due to school holidays, getting ready for overseas visitors, and very poorly children in this little house. So we feel like we haven't achieved much. Col will no doubt disagree as he has been very busy with Nick-Nack our fab chippie, who has been teaching him 'this and that' in the way of custom joinery and table saw skills. So I guess I'm the one who feels like I haven't achieved much..apart from caring for our little girls and of course success in our mammoth garage sale on Saturday! As I haven't had the time to write, edit, photograph, or publish anything in particular this week, I thought I'd just do a small picture post of places we have been and things we have seen in the very few days we have had off since we've been back...a mini showcase of the city, surf and countryside we call home. We shall hopefully have a nice, new, shiny post next week showing the start of our bathroom reno..stay tuned! PS - If you want to get all the newly published posts straight in your inbox, subscribe by adding your email address to Sunshine in my Inbox over on the right -> and hitting submit!! Too easy!